Hotel Riddhi Siddhi has defined a benchmark of fine living at budget cost in Haridwar. It is ideally located 2 mins walking distance from railway station & bus stand. Har ki Pauri & other local site seeings are just a km away. 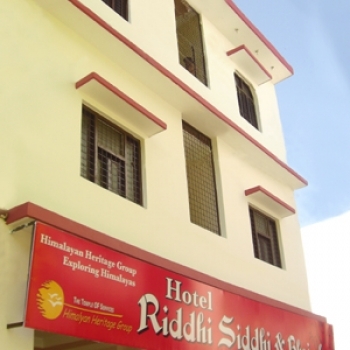 Riddhi Siddhi hotel is located 100 Mtr from Haridwar Railway & Bus Station, 1 Km from famous Har Ki Pauri & 800 mtr from NH 58, 38 Km from Jolly grant Airport NH 58 and 500 Mtr Distance from Mansa Devi Temple. 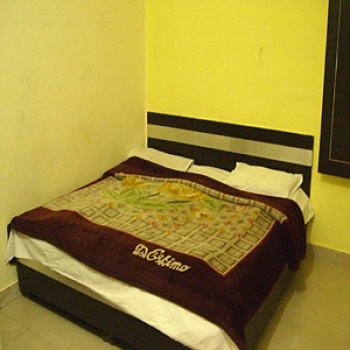 Thre are well-furnished rooms in Hotel Riddhi Siddhi with modern facilities. The rooms have attached bathrooms, with modern fittings and arrangements. The design and decor of these rooms are eye-catching. The rooms have beautiful upholstery, bedcovers, cushions and spreads, all showing class and style. Flights : In the region Air Services are available only upto Jolly grant airport in Dehradun which is 35 kms from Haridwar. Rail : This major pilgrimage center has been well connected by trains to all the major towns of India. Road : Haridwar, on the main highway, is connected to all major centres in the region and other parts of the country by road. There are buses available from Delhi to this place.